EVE Blog Banter #25: And by Alliance you mean.....? 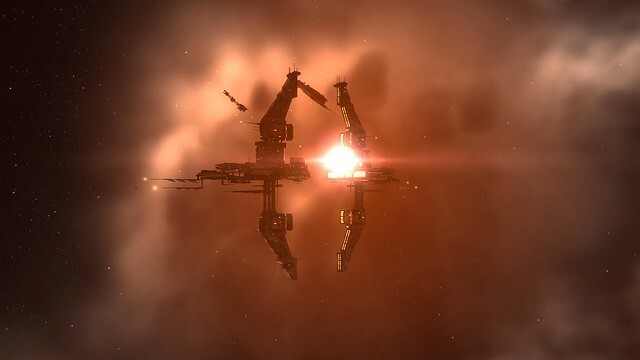 Welcome to the twenty-fifth installment of the EVE Blog Banter, the monthly EVE Online blogging extravaganza created by CrazyKinux. The EVE Blog Banter involves an enthusiastic group of gaming bloggers, a common topic within the realm of EVE Online, and a week or so to post articles pertaining to the said topic. The resulting articles can either be short or quite extensive, either funny or dead serious, but are always a great fun to read! Any questions about the EVE Blog Banter should be directed to crazykinux@gmail.com. Check for other EVE Blog Banter articles at the bottom of this post! This month's topic comes to us from @Tetraetc - "Tetra's EVE Blog" - who asks: "Have Alliances and the sovereignty system limited the amount of PVP and RP potential in Null sec? Imagine a Null Sec where anyone could build outposts, wherever. Would the reduction of the Alliance game mechanic, and the removal of the sovereignty game mechanics (and the modifcation of it from Alliance level to Corp level for that matter) force more PVP into Null sec, or would giant power blocs like the NC still form themselves?" This is one of those rare occasions where it's hard for me to state my opinion. The reason is simple: I just don't think I know enough to grasp the various issues at hand when it comes to Alliances, sovereignty and how all this ties into 0.0 space. I do understand the basics, but to actually suggest that the current alliance game mechanics have a positive or detrimental effect on PvP or RP, and be able to defend my arguments is beyond such understanding. As such, I'll have a lot of reading to do, though I feel confident that I'll be in the know once I go through everyone's Banter! So, without further ado, here they are! CrazyKinux's Musing: EVE Blog Banter #25: And by Alliance you mean.....? Blog Banter 25: Nerfing Nulsec « OMG! You're a Chick?! ...Shall we not Revenge? : BB 25: What if the Alliance vanished? EVEOGANDA: BB25: Sov 'n Go! Helicity Boson » Blog Banter #25 Nullsec and sov. >>>Vigil Ant: Alliances and SOV by Munny's eyes. Sleepless in Space: Blog Banter #25: Moar Low Sec! Yosagi Yojimbo - Gallente Exile: EVE Blog Banter #25: And By Alliance You Mean Blob? These clips hint at a great talent. I just wish they were a bit longer and that their creator, Ben Reubold, would use some of the New Eden canon for his next one! Drone 23 from Ben Reubold on Vimeo. SOLAR from Ben Reubold on Vimeo. It's 1:22AM. I'm exhausted and should have been in bed hours ago. And yet, I've just logged into EVE and popped open another can of Guinness. A short while ago Memoocan and I finished recording a 90 minute segment for our upcoming and much delayed 2nd episode. During this recording we had CCP Dashai and CCP Manifest talk about how they came on board CCP Games, discuss their up coming special Fan event at PAX East, as well as the EVE Fanfest of course. Suffice to say we had a hell of a good time, and I just can't wait to get to Reykjavik in a little over 3 weeks! We still have some more recording to do, but I'd like to get the episode out to you either by the end of the week-end, or on Monday at the very latest - just as the 25th EVE Blog Banter gets published all over the EVE Blogsphere. Last sip of Guinness has been taken. This capsuleers needs his shuteye! Fly safe! Made it into the Darkspore Beta. But when will I jump in? Earlier this week I managed to wedge myself into the Darkspore Beta thanks to the folks at GameShadow! I was very excited to have a chance another Beta and was looking forward to that first moment, when the screen loads for the very first time on a new canvas of virtual pleasure and a new beginning awaits you. So after some fiddling with my EA account, a few downloads and updates to their client, I was ready to jump on board. Then I read a short sentence: "Beta servers are closed" What? Ah, okay. They open up the servers only at specific times. Better check the forums to learn when. Only fortunately I didn't have any time this week-end to do just that. With a fully loaded social calendar, and the MiniCKs to entertain and train, very little time was left to gaming. Let's hope this week provides me with the oppornutity to do so. In the mean time, I'll have these promotional videos to drool over. Man, I can't wait! Looks fun no? Are you in the BETA? A stargate and setting star in all their glory. New Eden still amazes me despite roaming its vast expenses for over seven years now! Wow, has it really been a month since my last Speedlinking post? Time flies! So many great links this week it's hard to keep up! First, some good laughs: High Sec, Low Sec and 0.0 like you've never seen them before! The Rise of the ISK Printing Machines: A Case Study on Bots. EvE-Online Fanfest 2009 Documentary from Oddur Elíasson on Vimeo. Every year or so a celebration is held in the name of EvE-Online. This celebration is calld Fanfest and hundreds of EvE players gather in Iceland to put real faces to avatars, to enjoy the company of EvE players from other parts of the world, to learn about upcoming events in EvE and also just to celebrate the world of EvE-Online. This short documentary is to give a look into what fanfest is all about, to show the people that play the game and what they think of Fanfest and EvE-Online! The above title is of course meant as a teaser, since I know a fair amount of women playing EVE - and not just the carebearing kind! I came across the Youtube channel of @Mintchiplol, a new Twitter follower of mine. And after watching a few of her videos, I came across the one below. Now @Mintchiplol from what I gather seems to be quite the PvP gamer, though she's fairly new to New Eden. So it was interesting to see how she describes how EVE is a more complex MMO environment then what she was familiar with in Word of Warcraft. Not a bashing of WoW here, but just interesting to see how a newbie can quickly nail the main differences between a theme-park MMO and a sand-box. Thanks for the videos @Mintchiplol and hope to see you in space! In the hopes of cleaning up this blog's realstate, I've decided to move over some of the links I provide in the right-column to actual posts - just as I did years ago with the EVE Blogroll and the Guides. Earlier this week I cleaned up the EVE Blog Pack, removing outdated blogs and adding a fresh new set of prolific EVE Online bloggers. In doing so, I turned down a few bloggers who had made the request to get added to the Pack. Last evening I set myself to the task of cleaning up my Unread emails that were related to this blog. Some of these dated back to last November. You see, despite the fact that I may not be as productive in writing about my experience in EVE as I was in the past, I still get a ton of emails, which all warrant my attention. And sometimes, some of these request slip through the cracks. Just as great blogs can sometimes get overlooked. Fiddler's Edge is one of those. Without realizing the terrible mistake I was about to make, I simply declined his request, once again, to join the Pack. And now, Mord seems to have decided to move on. I've just spent the last hour, going through emails and evemails, from folks asking me to add Fiddler's Edge to the Pack. Mord even wrote about it and got a ton of comments to encourage him to continue and to disregard my blatant mistake. And indeed it was a mistake not to included him. But hopefully it's a mistake that can be corrected. This is where you come in. I need you to head over to his blog and add to the comments, and request that he reconsider and continue to do what he's been doing all these months; writing a great blog, for the benefit of his readers and the EVE Blogging community. And Mord, if you're reading this, I hope you'll forgive this ol'time EVE Blogger, and provide us the privilege to be part of the EVE Blog Pack! I just can't wait to see this movie! Mark your calendars, March 11th, 2011! Earlier last week, the folks behind EON released what can only be described and the ultimate, most complete, heavy-weight EVE Online Guide. It's been a long time coming but it's finally here! The ultimate guide to EVE Online and it's all yours, for FREE. Whether your a new or old player, there is something useful for everyone. So for your free download, yes free, please visit www.isktheguide.com from 1st February. So head over, download and save the Guide. But unless you're unaffected by the cost deforestation, leave it at the digital stage. Printing this phone-book-sized guide is out of the question! Making the Pack: 10 blogs make the cut as the Blog Pack gets refreshed! As hinted earlier this year, the EVE Blog Pack got reviewed during the week-end. Some blogs were removed, some old Pack members were pulled out of retirement, and quite a few new blogger got to be part of the EVE Online Blogging Elite. I've decided to give a chance to an old Pack member, A Scout's Domain's Lumenarious Rex (@Lumenarious_Rex), who recently returned to EVE. The lad had always written great posts. I've given him a grace period to get his blog updated! Also new to the Pack is the folks from EON magazine. The volunteered and have recently been putting out some great posts. As always, if you think you've got the Right Stuff, write great content, guides, advice and would like to be part of the EVE Blog Pack, please let me know. I'm always looking for canon fodder,... uh, I mean great talent!